Kometos Finntray – Ready at once? Our product range includes a variety of packaging and material handling systems for the food processing industry. We offer system solutions that meet the needs of customers and are able to enhance and improve the production process. All delivered systems meet the strictest quality and hygienic requirements. Our in-house design and manufacturing allows us to provide customers with standard products as well as customized solutions. 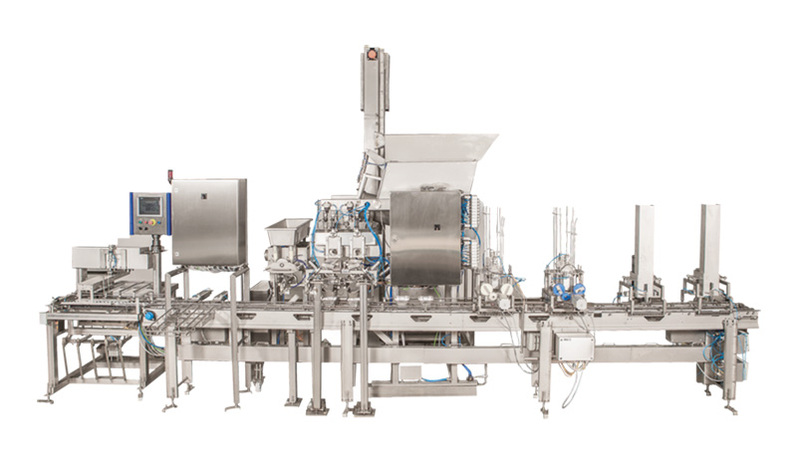 The dosing line is used for dosing solid product components or their mixes and adding sauce/cream or other liquid components to create a ready meal. The line can be used for soups, potato, carrot, beetroot, beans, rice, macaroni or pasta, cheese cubes, meat cubes or stipes, fish pieces or several componets that are premixed. Capacity 25 – 35 portions/minute with 2 dosing heads. A flexible loading system for minced meat portions into plastic trays automatically. The line can be integrated with a traysealer machine and can be equipped e.g. with checkweighers and x-rays. Manufactured from certified plastic and stainless steel materials for food contact use.